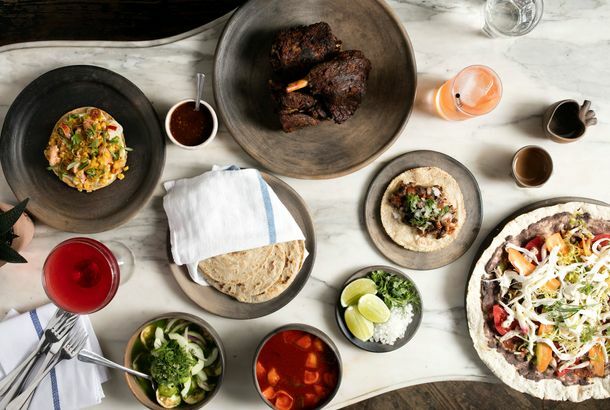 First Look at Claro, a Oaxacan-Inspired Restaurant in GowanusTwo Union Square Cafe alums focus on goat barbacoa, antojitos, and moles. First Look at Freek’s Mill, a Seasonal-Small-Plates Joint in GowanusIt’s big on vegetables, cocktails, and Georgian wine. Pies ‘n’ Thighs Pops Up at Threes BrewingWash down all that beer with chicken biscuits and braised bratwurst. Roberta’s Unveils the First Tex-Mex Menu That New Yorkers Might ActuallyThe famed restaurant is serving “dirty queso” and fajitas at a weekend pop-up — oh, and also pizza, of course. 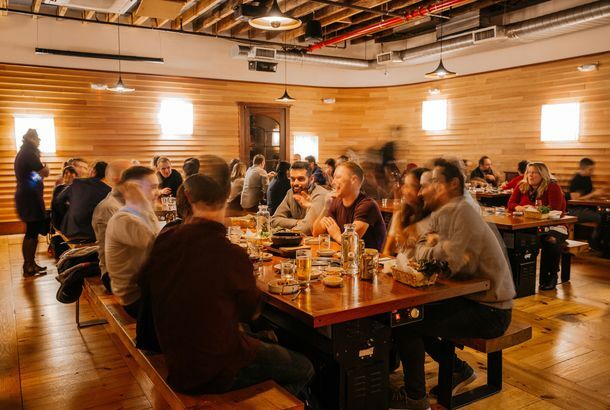 The Threes Brewing Summer Food Lineup Is SpectacularRoberta’s, Battersby, and Franny’s will all pop up at the Gowanus beer hall. Brooklyn’s All-Pierogi Restaurant Just Opened — Here’s a LookThere was an hour-long wait on opening day. There’s an All-Pierogi Restaurant Opening in BrooklynIt’s even going to serve macaroni-and-cheese dumplings. Why It Was a Very Good Year for Ample Hills’ Ice CreamBrian Smith opened a massive new shop, released a cookbook, and began making inroads into becoming a major national player. Threes Brewing Opens in Gowanus Next Week, With Roberta’s PizzaIt’s 8,000 square feet! What to Eat at Ample Hills Creamery’s Ice-Cream ParadiseChocolate cones, salted-crack caramel, and warm sundaes. Four & Twenty Blackbirds Opening Massive New Pie Wonderland This SummerOwners Emily and Melissa Elsen plan to open a 3,000-square-foot mixed use facility in August. Neighbors Say Whole Foods Brooklyn Workers Block the Bike LaneThe Third Avenue sidewalk isn’t safe, they say. Royal Palms Shuffleboard Club Opens Tonight: Here’s Everything You Need toGet your biscuits ready and break out your tangs! Ample Hills Creamery Opening Second Ice-Cream Shop in GowanusThe three-year-old Prospect Heights shop opens a second location. Royal Palms Shuffleboard Club in Gowanus Opens Next WeekGet your visors and your orthopedic shoes on. Chef Angelo Romano Leaving the PinesThe chef says he’s looking to open a new restaurant. Dueling Cocktails at Donna; Ice-Cream Social and Boozy Gummy Bears at WhiskeyPlus: fake cronuts dispensed by people dressed like mimes, Pepsi wins over Coke at CUNY, and more in today’s leftovers. The Pines Begins Accepting Credit Cards Next WeekCheck out the backyard while you’re there. Gowanus Residents Sue to Block Incoming 8,000-Square-Foot Rock & Roll PlayhouseNeighbors fear the Rock & Roll Playhouse is a little more rock and roll than purported. Rooftop Greenhouse at Whole Foods Gowanus Will Produce Veggies for City StoresThe grocer will produce salad greens and herbs in Gowanus. Matt Abramcyk Helming Boutique Hotel Gowanus Inn & YardThey unpaved a parking lot and put up a boutique hotel. Gowanus Residents Call Shuffleboard Bar Royal Palms a Royal PainThe conflict should be settled over a relaxing game of parcheesi. Brooklyn Brine’s Lacto-Fermentatistic New Retail Shop Now OpenBrooklyn Brine goes brick-and-mortar in Gowanus. Shuffleboard Bar Coming Soon to GowanusOld-people-themed fun! Four & Twenty Blackbirds Rolls Out New Holiday PieIt’s called Egg ‘N’ Grog pie. Littleneck Enlists Big MacherA bold move. Gowanus’s Forthcoming Littleneck Has Enough Clams to OpenClam belly sandwiches are one now step closer to being a reality in Gowanus. Gowanus Whole Foods Gets Initial CB6 ApprovalThe community board’s land-use committee gave the supermarket’s plans a green light. Beats Meet Eats at Two Outdoor Parties in BrooklynFinger on the Pulse’s barbecues are back, and Mister Sunday comes to Gowanus Grove. Gowanus Whole Foods: It’s Still HappeningA company exec promises it’s still happening. Sunday Best Parties Continue at Former BKLYN YardIt’s now called 400 Carroll Street. But will there be booze? Summer Bummer: Sun Sets on BKLYN Yard PartiesAfter four years, one of the city’s best outdoor venues is gone. Two More Food-TruckapaloozasTwo chances to make the rounds among a bevy of mobile vendors. Spring Ramp Menu at Marc Forgione; Fornino Pizza Expands to Park SlopePlus: Earth Awareness Week discount at Il Buco, and free cocktails at Haru, in our daily roundup of neighborhood food news.